Autumn is here…And the air is chilly, crisp and very sweet. It is that special time of year that makes its presence felt even in a warm place like Mumbai. It is sweet because it carries the promise of festivities.. In India, the period of festivals begin! Navratri is here, and Bengali Durgo Pujo is right behind!!!! 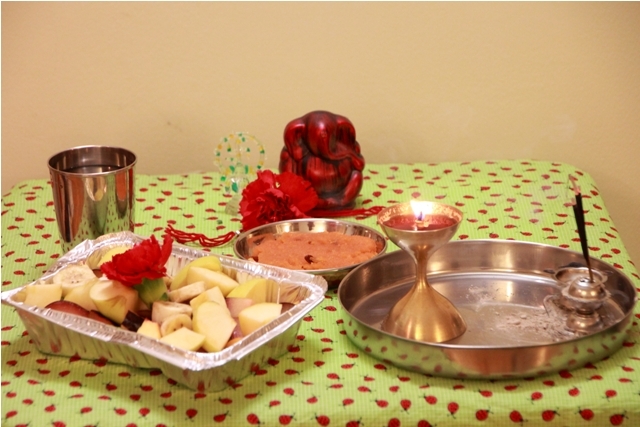 Laxmi Puja and Indian Christmas Diwali!!! Have missed Durga Puja now for the past 2 years. It is celebrated here in the US but not on “tithi” days (days designated as per Hindu calendar), rather when the community hall is free. 🙂 Not much fun driving for hours knowing that Pujo is actually already over. I have never witnessed Pujo in Calcutta, something my husband assures me, is one of the things to do before you die. 🙂 I can imagine its splendour based on what I have experienced, Ganpati festival in Mumbai. Absolutely love it…Still remember feeling goosebumps when you witness Lord Ganesh in all His glory leaving for heavenly abode. It used to bring tears in my eyes. Now I miss those tears too…People are just as emotional in Bengal when Maa Durga returns home. There are several festivities within Pujo like sidoor khela (married women applying vermilion to Maa Durga and each other). Most memorable and perhaps the most important are Ashtami and Navami. (Bongs correct me if I am wrong). I write here from my childhood memories of trooping from Andheri E, to Santa Cruz pandal to Khar Ramkrishna Mission and finally ending at Shivaji Park, the largest pandal in Mumbai. We used to leave home around 7 pm and come back home by the last train, in those days the 2 pm train from Churchgate. The whole night we would troop from one pandal to another, meeting up with our Bengali friends and relatives. Was super super fun!! The food too was a great incentive for us kids. Dad would jump on the chance of catching up with Bengali music and magazines…. The one in Malad was started by my dad’s friends. I don’t know if it has continued still. Its been a decade since I have witnessed it. Aah nostalgia. Thank U 🙂 Which Uni are u at? Samiksha Desai-Sheth likes this post. Ronita Dasgupta likes this post.